That art has this power to haunt us to such a degree that we scheme of ways to see what we have heard about or seen in reproduction or can easily access on the internet is one of those fascinating mysteries of modern life. A mystery, because it is by no means certain that the thing that haunts me will have the same effect on someone else. Because in the end, our responses to works of art are complex and personal and attempts to intellectualize the process seem to me doomed to failure. In this talk, Keith Christiansen shares some of his strategies for looking at Renaissance and baroque painting. 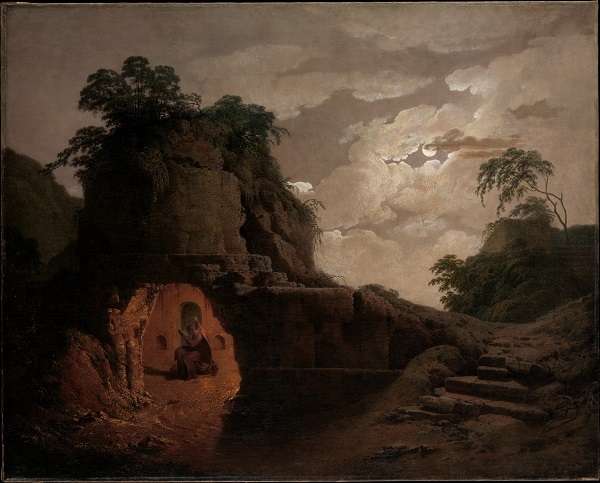 Image: Joseph Wright, "Virgil's Tomb by Moonlight, with Silius Italicus Declaiming" (detail), 1779. Oil on canvas. The Metropolitan Museum of Art.